A $170 million Russian Mars probe, stranded in low-Earth orbit after a malfunction following launch in November, reportedly fell back into the dense lower atmosphere Sunday, apparently breaking up over the southern Pacific Ocean west of Chile. Russian engineers predicted the massive spacecraft, loaded with more than 11 tons of unused rocket fuel, would burn up during entry, but 20 to 30 pieces of debris, totaling several hundred pounds, were expected to survive atmospheric heating to hit the surface. In a statement released last month, Roscosmos, the Russian federal space agency, said the spacecraft's propellant -- highly toxic nitrogen tetroxide and dimethylhydrazine rocket fuel -- would burn up in the atmosphere and posed no threat to the public. Likewise, the agency said that 10 micrograms of radioactive Cobalt-57, used in one of the spacecraft's experiments, would not pose a health threat or have any adverse environmental threat. The Associated Press, quoting the Russian military Sunday, said entry occurred over the Pacific Ocean 775 miles west of Wellington Island off the coast of southern Chile. Ria Novosti, quoting the same Russian defense ministry spokesman, said entry occurred around 12:45 p.m. EST (GMT-5). There were no immediate reports of any sightings. Sunday's fall to Earth marked the third uncontrolled re-entry of a large satellite since September. NASA's 6.3-ton Upper Atmosphere Research Satellite fell back to Earth late Sept. 23 U.S. time, showering debris harmlessly into the south Pacific Ocean, and wreckage from Germany's 1.7-ton ROSAT X-ray telescope fell without incident into the Bay of Bengal on Oct. 23. The Phobos-Grunt (ground) spacecraft was launched atop a two-stage Zenit-2 rocket on Nov. 9 from the Baikonur Cosmodrome in Kazakhstan. It successfully reached its preliminary parking orbit, but the spacecraft's main propulsion module, or MDU, did not ignite as expected for the first of two "burns" to boost the craft onto an interplanetary trajectory to Mars. On Nov. 21, the launch window for a normal trajectory to Mars closed, ending any chance for the planned mission even if the spacecraft could be recovered. 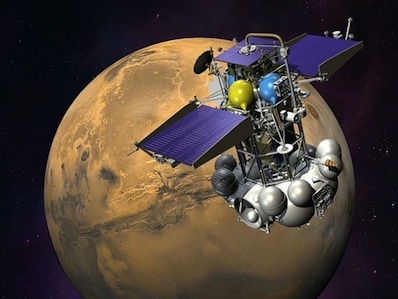 Phobos-Grunt was expected to reach Mars in October. The flight plan called for the spacecraft to jettison its propulsion module, used for trajectory correction maneuvers and to brake into orbit, and release a small Chinese orbiter. In early 2013, the Russian mother craft was to maneuver itself to a precisely orchestrated landing on Phobos, one of two small martian moons. A half-pound of soil was to be collected and launched back to Earth in 2014 for detailed laboratory analysis.